To make these gluten free, use corn tortillas. Lay the tortillas flat on a cookie sheet. Sprinkle some of the cheese on 1 half of each tortilla. Try not to get it too close to the edge. 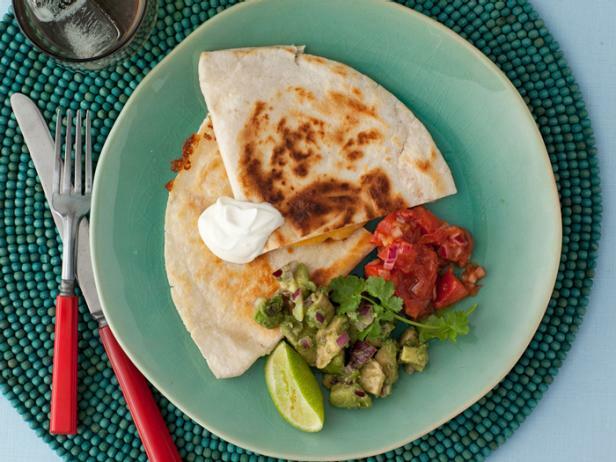 Fold the tortillas in half over the cheese to make a half-moon. Warm a skillet over low heat and add 1 tablespoon of the butter. Add the tortilla to the skillet and cook until it is lightly brown, about 2 minutes. Using a spatula, gently lift the edge so you can check. When 1 side is brown, turn the tortilla over and cook the other side until brown and the cheese is all gooey. Use a spatula to transfer to individual plates or a large platter. Repeat with remaining butter and tortillas. Top them with the sour cream, salsa and guacamole.